LEARNINGS FROM EMBRACING THE VEGAN LARDER. When we were still in the blue sky phase of Lost Boys Pizza we were adamant that whatever we did with the site had to be meaningful – zero plastics, avoid paper wastage, a menu that would be super allergen-friendly and all of that meant we were also setting ourselves out to be as accessible to veganism as possible while still selling meaty pizzas. Historically it has always been smart practice among Operators of note to have a strong vegetarian option as, in a group of four friends, it was considered that the veggie was generally the decision maker. I am certain that the widespread offer of a goats cheese tartlet on defrosted puff pastry has done nobody’s cover count any favours since 2006 while the post Ottolenghi generation’s shaksukas and burned eggplant salads have had the opposite effect. The mantle of decision maker has been passed on to the growing tribe of Vegans now, and the same rules apply. Having consulted for Vegan Restaurants in the past I had always been amazed at the negative value that vegan pizza offerings presented and the lack of creativity in most chefs’ approach to the challenge. The main contributor to my dissatisfaction here is vegan cheese. Good vegan cheese is really expensive, and even the good stuff is a poor substitute for real mozzarella. While lifelong vegans accept vegan cheese as the norm, anyone looking to switch from the real stuff to vegan or non-dairy is generally disappointed with the product. Nevertheless – we took the standpoint that ‘its not what you know its what you can prove’ and set about putting a range of options together while organizing a focus group for tastings. I’ll outline the results for comparison below. Last Runner Up was Violife – although this rated highest on the list of bought vegan cheeses. More challenging than flavor or texture with this product is the price. At an average £12 per kilo it is literally 300% of the cost of mozzarella and as a startup we would not have had the luxury of concession pricing which would have meant charging more for our cheapest vegan pizza than we did our most expensive meat pizza – hard pass. Next in line was our home made cashew & macadamia cheeses. Both well received but left us two concerns; firstly, the cost, which we had managed to get to a more manageable 200% of the cost of mozzarella but more importantly in our eyes was the element of using our tiny (3×2 metre) kitchen to process nuts. With so much heightened awareness surrounding the 14 allergens these days the thought of cross contaminating our dough, cheese, or tomato sauce (allium free, ‘natch) simply did not bare thinking about. There was an unexpected learning in this process as we also presented vegan sausages and cold cuts as toppings. The more militant among the focus group protested animal product substitutes as a genre claiming that, since cheese and salami should not be consumed in the first place, there should be nothing to substitute. While we were not expecting this reaction it is a welcome point of reference for developing vegan menu items moving forward. So finally we presented our own suggestions. Two pizzas that used combinations of vegetables to replicate the pull, crunch and chew of oven-fresh cheese, my personal preference being the combination of roasted kale, soft fried shallots, lemon zest and oregano, closely followed by the marriage of rocket, pickled mushrooms and brined artichoke. The reception to these offerings was overwhelmingly positive. We had found our hook simply by embracing the vegan larder. 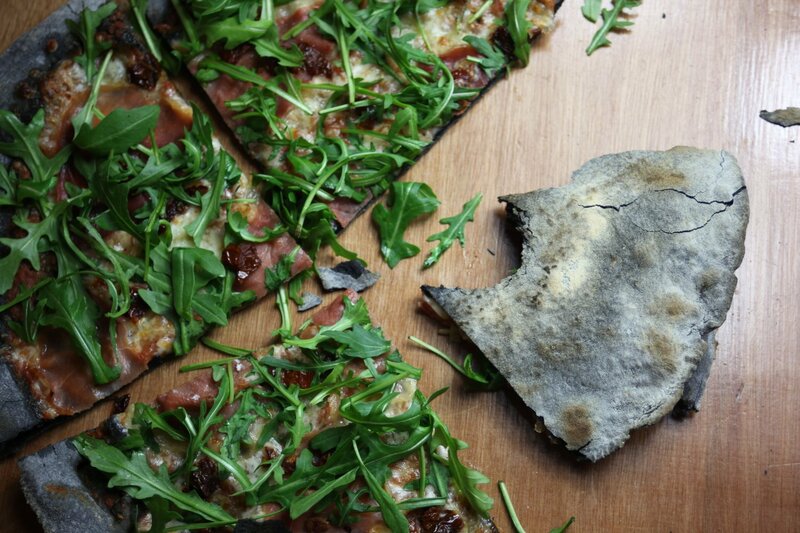 A year down the line both our vegan pizza options (now branded as the Kale All Vampires and Coffin Dodger, respectively) continue to be in our top 4 selling items and the care we took in the approach to menu development continues to reap rewards. We continue to be open to new ideas (we are currently experimenting with nutritional yeast on vegan pizzas) and are happy to meet new vegan diners every day who are always excited by our menu. Veganism is on the rise, and vegans always bring friends.